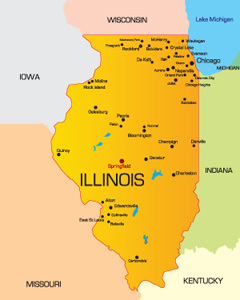 Illinois is the 5th most populous state in the United States with a population of nearly 13,000,000 people and is known as The Land of Lincoln. One interesting fact about Illinois is that three presidents have been named president while living in Illinois: Abraham Lincoln, Ulysses S. Grant, and Barack Obama. It is bordered by Indiana, Wisconsin, Kentucky, Missouri, and Iowa. The capital of Illinois is Springfield but the largest city is Chicago which is home to nearly 3 million people. The major highways in the state are I-29, I-39, I-55, I-57 and I-64. Other modes of transportation include OÕHare International Airport in Chicago. Illinois has numerous museums such as the Abraham Lincoln Presidential Library and Museum and the John G. Shedd Aquarium. You can go see a Chicago Cubs or Chicago White Sox game for some family fun and good food. Notable universities within the state are the University of Chicago and Northwestern University.